Hot pot restaurants are especially popular during the winter season when the city cools down and diners are looking for a nice hot meal. For newcomers to this style of eating, ordering at hot pot restaurants can be a little tricky, as finding the best mixture of meats and vegetables is developed through experience. So here are nine reputable hot pot restaurants in downtown Beijing for newcomers to start their hot pot journey. 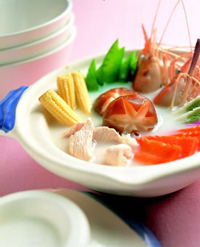 Similar to fondue cooking, hot pot is a style of cuisine in which diners select meats and vegetables and prepare their own communal meal in a large pot filled with a usually spicy broth. Hop pot restaurants are especially popular for large parties as they create a collective cooking and eating experience.